A few weeks ago I went to my first air show – RIAT 2011. I’d always wanted to attend an air show but never really had the opportunity. What was nice about RIAT was that there was a group of us going (Shak, Tam and Ro), we were all going with a load of photography gear and the tickets worked out a bit cheaper as BAE Systems was a sponsor. What this meant was £10 off the ticket price, free lunch (which was actually pretty good) and use of a BAE Systems marquee…oh, and a free program. For the weekend I hired a lens to try and take better advantage of the air show. My current lens doesn’t have the reach and while the lens hire cots just under £100, then lens I hired would costs nearer £1300 to buy so it was a bit of ano brainer. What was most disappointing though was the weather. We arrived at RAF Fairford for 07:45 and 5 mins standing in a queue was enough to drench our jeans. We all had waterproof jackets but it was still a poor start. We headed straight for the BAE marquee…which became our home for the next 4 1/2 hours as the rain just wouldn’t stop. The show should have started at 10:00 but instead it was nearer 12:30 before an Apache took to the skies. Unfortunately this meant that some of the aircraft didn’t fly on the Saturday. More annoyingly, the presenter kept telling us over the tannoy about how good the aircraft that wasn’t flying was in practice the day before. Shut up! However I loved the show. 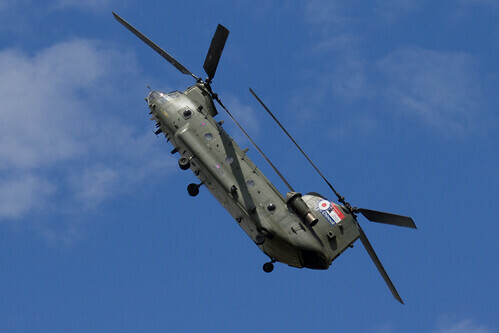 It was great seeing the Apache, The Red Arrows, Eurofighter and the Chinook. I loved the Mustang and Spitfire as well. What I didn’t love was how difficult it was to photograph some of the planes. This was due to a number of issues. Firstly, jets move quickly. Obvious I know but keeping a jet in frame as I snapped was tricky. It was also tricky to keep it in frame and in focus. So many photo’s I took just weren’t very sharp. My biggest issue (apart from lack of skill) was the weather. Initially dark and gloomy, it then changed to dark at one side of the airfield to brighter at the other end. It then changed again to dark at one end and bright blue sky at the other, before ending the day in lovely sunshine. Tricky. That didn’t stop me trying and by the end of the day I had taken just over 1200 photo’s. After ditching many and cleaning up others in Lightroom I finally got round to publishing 200 photo’s from RIAt on Flickr, handily split into sets. 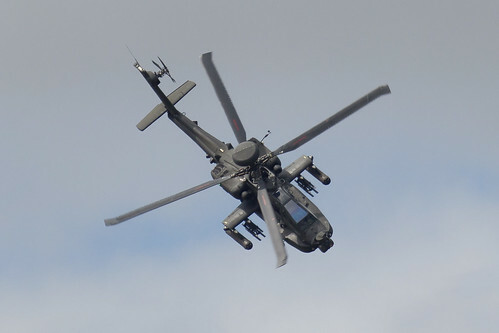 Probably the aircraft I most wanted to see – the Apache. I’ve loved this since I was a kid, having a large airfix dangling from the ceiling. I couldn’t believe how manoeuvrable it was at the show. It managed a barrell roll. In a helicopter. Awesome. Also impressive was the Chinook. A massive beast but it was being thrown around the show as if it was a toy. Full helicopter set can be found on Flickr. 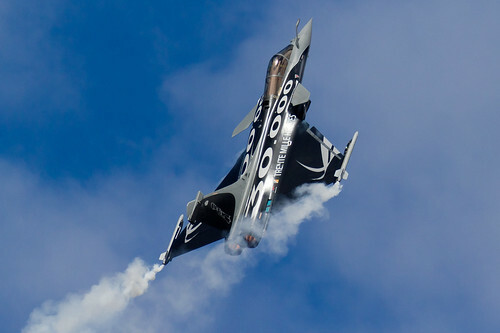 Some amazing displays but the one that stood out was the Rafale. A great 10 minute display with the pilot really pulling out a great show. Also impressive was the EuroFighter but it didn’t do too much at the show apart from look and sound good! Full set can be found on Flickr. 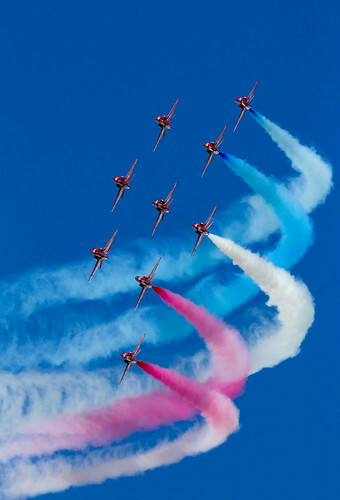 Some great display teams at RIAT with the Red Arrows coming out on top. 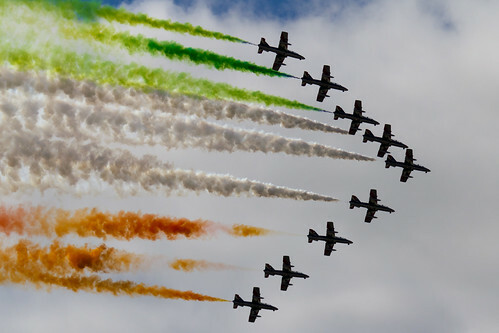 However special mention goes to the Italian Frecce Tricolori display team. Great colour and variety during there display but lifted by the great commentator. You had to be there to understand why but it did make us all laugh. 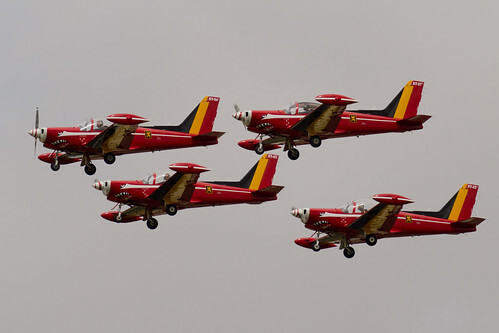 My favourite picture from the displays though was the Belgian display team – Les Diables Rouge. It’s not the planes but the pilots. A mixture of concentration and one of them glancing over to the crowd. Love it. Click through to the full display set on Flickr. A few great old planes on display and I was pretty stunned that when the Vulcan had landed around half of the crowd left – there was still around 2 hours of flying! I guess there’s a lot of love out there for the Vulcan that I didn’t appreciate. 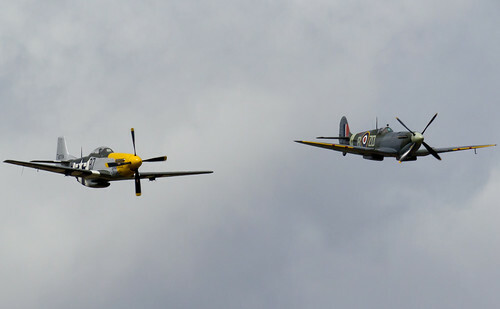 Favourite for me though was the Spitfire, seen here with a Mustang. The sound it made was great – can’t imagine how hundreds of Spitfires taking off in WWII must have sounded. Full set of classics can be found here on Flickr. So a great day and weekend which wasn’t spoiled by me and Shak being sick – pair of lightweights. Thanks to Tam for putting us up (and putting up with us) and also Lynne for the great cooking. Pleased to have seen so many great planes but don’t think I’ve caught the airshow bug. One was enough…for now. Spitfire, woof… everything else is just soulless lumps of metal, but a Spitfire, hmmmmmm…. woof woof. Some lovely looking pics there despite the weather. One was enough!?! You need to try one on your doorstep. Ricky – tend to agree. There’s just something about the Spitfire that means so much more. Allan – I guess this will be the last one as well now that Leuchars is being shut down. Just checked, maybe not the last as the closure timescale hasn’t been announced so might be there for a few years yet. Doubt I’ll manage through for September though. Need to actually buy that lens (or similar) first. The photo look great Ian. I hope mine are as good when I finally get round to sorting them out. How much post processing / cropping did you do? I had to do quite a bit of cropping, not too much, but quite a bit of work on noise and sharpness. Very few were pin sharp so I worked on them to make a slightly more presentable bunch. Compared to what I saw of your shots straight out the camera, yours were a lot sharper. Ian, nice pics. What lens did you rent and where did you get it from ? Somewhere local in Glasgow ? I rented a Canon EF 100-400mm f/4.5-5.6L IS USM from LensPimp. Although not local the delivery was on time (actually a day early) and it was delivered in an excellent case. Price was around £100 by the time you included delivery both ways but I was pleased with results and if I needed a lens I’d definitely use LensPimp again.